I have added high quality images of Hugh attending a photocall in California for “The Path” on the 17th to our photo archive. Thank you so much to my friend Lah from zigazig-ha.com for sending these gorgeous photos our way! Watch the official trailer for the Hulu original series The Path, premiering March 30. Hulu Original series The Path is a new drama from executive producer Jason Katims (Friday Night Lights, Parenthood). The Path follows a family at the center of a controversial cult movement as they struggle with relationships, faith, and power. Each episode takes an in-depth look at the gravitational pull of belief and what it means to choose between the life we live and the life we want. The Path comes to Hulu from Universal Television and Jason Katims’ True Jack Productions and was created by Jessica Goldberg who will write and executive- produce the series, along with Katims and Michelle Lee of True Jack Productions. The 10-episode series stars Aaron Paul, Michelle Monaghan and Hugh Dancy. I have added 33 high quality images of Hugh attending the 2016 aTVfest to our photo archive. Hugh, along with various members of his fellow cast members, were there promoting Hulu’s series The Path. In Hulu’s new series The Path (out March 30), you’ll see a familiar figure from stage and screen appear. 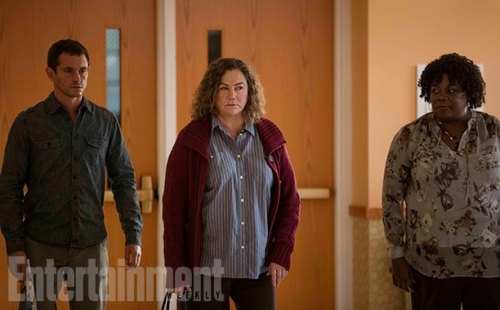 Above and below, see exclusive photos of Tony- and Oscar-nominated actress Kathleen Turner, who pops up in episode 3 to play Brenda Roberts, mother to Hugh Dancy’s character, Cal. I have added high quality images of Hugh attending Day 5 of the 2016 Winter TCA Tour promoting The Path to our photo archive. Watch the official first teaser trailer for the Hulu original series The Path, premiering March 30th. I have added a scan from the latest issue of Entertainment Weekly magazine to our photo archive, thanks to my friend Claudia over at marymcdonnell.org for sending the scan our way. It features an article on The Path. I have also typed it out below the ‘read more’ link for those who might want to translate it or make quick quotes. It really is a great article! 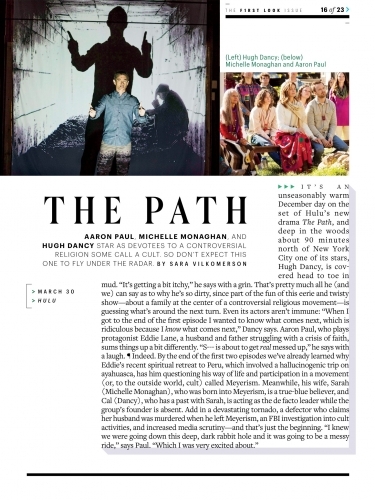 In March, Hulu will debut The Path, a drama that follows a family at the center of a controversial religious movement. In his first big role since his award-winning turn as Jesse Pinkman in Breaking Bad, Aaron Paul portrays Eddie Lane, a convert to Meyerism suffering a crisis of faith. 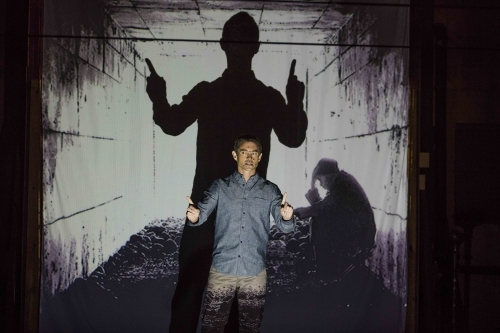 Click through for more exclusive photos of the eerie, twisty series, including Hugh Dancy as the movement’s unofficial leader. Cal is the charismatic, unofficial leader of The Meyerist Movement. Born into a Meyerist family, Sarah Lane serves as an important figure in the movement. Hawk is Eddie and Sarah’s teenage son, and Ashley is a popular classmate of Hawk’s who is not a member of Meyerism. Alison is a defector of the Meyerism movement. Head here for more exclusive intel on The Path, from our First Look issue on stands now or available for purchase here. The series comes to Hulu from Universal Television and Jason Katims’ True Jack Productions and was created by Jessica Goldberg who will write and executive-produce the series, along with Katims and Michelle Lee of True Jack Productions. The 10-episode series stars Aaron Paul, Michelle Monaghan, Hugh Dancy, and Rockmond Dunbar.